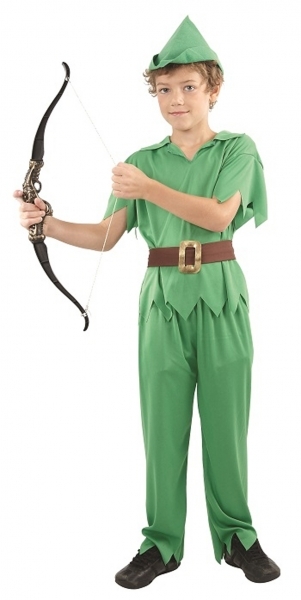 Escape to Neverland in this Pan look alike kids costume! Note: shoes, weapon are not inc.
FREE Express Post within Australia for orders over $89+. We charge a flat rate of $12.99 per order within Australia for all orders under $89 (regardless of how many items are purchased in one order.) Express post takes 2-3 business days to reach you. For all CBD Metro address deliveries, please ensure the company name and level number (if located in a multi storey building) is provided to ensure correct delivery of your order. In the event that an ordered item is not available or we are unable to fulfill your order, we will notify you within 2 business days to arrange an agreeable alternative item, a back order or full refund. We ship internationally around the world and all pricing is in AUD. To find out if we ship to your country, fill your shopping basket, once you have completed shopping check the dropdown box on your shopping cart to see if your country is listed. If it is listed our store can ship to you. We are not responsible for duties or taxes/delays that may be imposed by your country's customs department. All international orders are sent via Airmail/DHL or EMS Service being the most economical method with no tracking number. This service takes 5-12 business days to reach most countries. If you require express shipping, please email us or make a note on your order when you pay to add this service to your order when you place an order online. We will email you an additional invoice for the express shipping charges payment. This method takes 4-7 business days to reach most countries and is more costly. Please email us for a quote on express international shipping if you need this added to your order. Please be aware that we can not control any duties or delays imposed by your country's customs department. All orders are shipped within 1-2 business days. If for any reason you are not happy, Please contact us from the Classy-Couture contact page to arrange to return your order and quote your order number. A return approval must be requested before returning your purchase. We cannot accept return of intimate apparel (including costumes/corsets that include underwear) for health reasons unless they are faulty, please contact us if you find a fault to discuss return of your item. You are able to exchange corset sizes/styles if the item is returned in original unworn condition. ITEMS ON SALE/CLEARANCE are not able to be returned or exchanged, please choose these carefully. Please note that we do not refund shipping costs or the cost to return an item to us. If your order received free shipping and the entire order or part of the order is returned for a refund, the shipping cost of $9.99 will be deducted from the refund amount. To Return your order please send your order/item to us in its original undamaged packaging and with the invoice. Merchandise Credit: If the item is not suitable and you do not require an exchange, a credit note can be provided. We take great care in providing correct measurements in our sizing guides, however we also recognise that the fit sometimes may not be as desired. Therefore, we are happy to offer a free of charge exchange on sizes or styles (one per item.) Please note that we cannot accept return of intimate apparel (including costumes/corsets that include underwear) for health reasons unless they are faulty. If you need the exchange urgently, the most efficient way for you to get it fast is to place a new order for the correct size or item and follow our Returns procedure to get a refund for the original order. If time is not a worry, you can send the item back to us with a request for the correct size, however please note that inventory can't be held until the returned items are received. If an exchange or another item is not suitable a refund can be provided, less postage costs. Please note: We cannot accept return of products with any make-up marks, fake tan, or other marks/damage on the item. If your item is faulty upon receipt or incorrect size, we will gladly exchange/replace the item. All returns are subject to us receiving the item back within 7 days of the return approval date. Items must be returned with their original packaging and, unless they were damaged prior to you receiving them, they must still be in an unused and saleable condition. You can exchange within 30 days of your receiving the item. Please note that in order for the exchange to be accepted, all tags must remain on garments. The condition of the item must be re-sellable. We will not accept the exchange of any item that is considered used. Please note that before an exchange can be done, you must contact us within 30 days of receipt date and the goods must be received at our store within 7 days of the return approval date. We cannot accept return of intimate apparel (including costumes that include underwear) for health reasons unless they are faulty, please contact us if you find a fault to discuss return of your item. Please note that we do not refund shipping costs or the cost to return an item to us. Please include a note to let us know what you would like. Items that are pre-orders (itemised as 7-10 day delivery) are NOT able to be cancelled before delivery, though you are able to exchange after delivery. All pre orders are final and items cannot be added to order.